The History Of Beijing: Explore Tiananmen Square and the Forbidden City on a privately guided tour. Walk along the Great Wall—one of the Seven New Wonders of the World—and see the beautiful forests below. Meet China's Pandas: Observe a variety of delightful pandas on a privately guided visit to Chengdu Research Base of Giant Panda Breeding—China's premier institution devoted to the preservation of these rare and beloved animals. 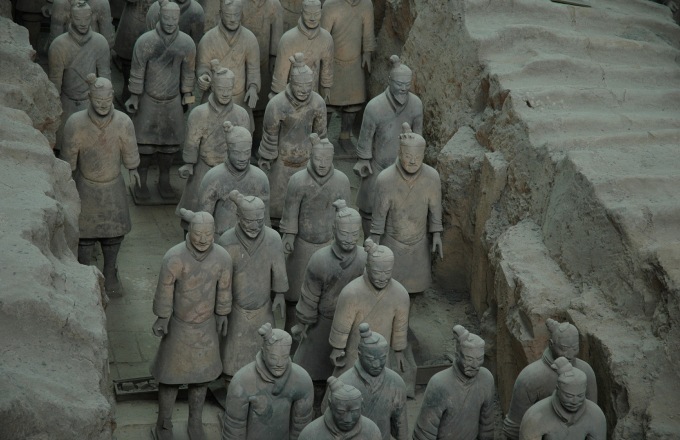 Terracotta Warriors And Horses In Xi'an: Take an excursion to Xi'an for a privately guided visit to see the platoons of terracotta warriors and horses. Buried with China's first emperor, Qin Shi Huang Di, these reddish clay sculptures are among the most significant archeological finds of the 20th century! Explore Hong Kong: Be awed by the panoramic vistas of Hong Kong from atop Victoria Peak, shop at the world-famous Stanley Market and enjoy this city's excellent culinary offerings. Cultural Entertainment: Enjoy traditional Chinese culture with a performance of the Sichuan Opera—featuring the magical art of face changing. Be amazed when you see actors changing more than 10 masks in under 20 seconds! Visit Hong Kong Disneyland Resort And Shanghai Disneyland Resort: Top off your visit to Hong Kong with the magical experience of Hong Kong Disneyland, which boasts 7 lands. And while you're on the mainland, thrill to Shanghai Disney Resort—the newest Disney Resort in existence—with a theme park featuring some attractions you can't find anywhere else! Breakfast At The Hotel: Enjoy a filling breakfast before you head to the airport for your flight to Beijing. Flight To Beijing: Relax while we handle your luggage and arrange for transportation to the airport. Once onboard the plane, enjoy lunch and arrive ready for your visit to Beijing, the capital of the People's Republic of China. Arrive In Beijing: Upon exiting customs, be greeted by an Adventures by Disney representative who escorts you to your transfer vehicle. Relax as the driver assists with your luggage and escorts you to the Rosewood Beijing hotel. Check-In At The Rosewood Beijing: Your Adventure Guides will help with your check-in and luggage as you explore this elegant luxury hotel. Combining tradition with contemporary style, the Rosewood Beijing is located in the heart of China's bustling capital and offers superb comfort and a host of delightful amenities. On Your Own Afternoon In Beijing: Spend the rest of the afternoon investigating Beijing. Ask your Adventure Guides for suggestions, since there are so many sites to see and things to do in this thrilling city where the ancient and the modern live side by side. Dinner At Duck De Chine: Enjoy a scrumptious dinner at this restaurant in the 1949-The Hidden City dining and nightlife complex. Duck de Chine's industrial chic décor provides a laid-back ambiance while its menu features a variety of duck and non-duck delicacies with Chinese and French influences. If you want to choose the most popular menu item, delight in the classic Peking Duck combo of slices of crisp roast duck rolled in soft pancakes with plum sauce, spring onion and cucumber. Beijing Departure At Shanghai Pudong International Airport (Pvg).